I made my way through quite a few cruelty free bath and body products this past month, so I thought I would share them along with a quick review for each! Burt's Bees Renewal Refining Cleanser - I liked the mild floral smell to this product, and it is quite a big container for the $10 price tag. It has a slight exfoliation to it and lasted a good amount of time (I think I purchased well before Christmas time). Despite all these pros, I just feel meh about it. It was a decent enough face wash, but I don't think I will be repurchasing. 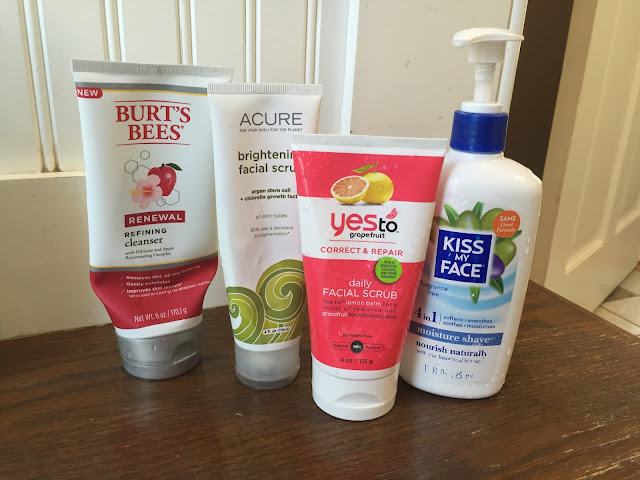 Yes to Grapefruit Daily Facial Scrub - LOVE this face wash! It smells amazing and has just the right amount of "scrub" to it. I will definitely be picking this one up again. One caution...it is a little watery, so be careful when you put it on your hand. I have had it slide right off my hand and down the drain a couple of times! Kiss My Face Moisture Shave - I think I have mentioned this product on here before, but I can't rave about it enough. It is superior to all shaving creams, EVER. I find it in my local grocery store for about $5 and it not only lasts eons longer than typical shaving cream, but also does a much better job. Soapbox Bataua Fruit - This conditioner smells SO good. It makes my hair very shiny and soft, and I can pick up the scent on my hair sometimes even a day after using - which I don't mind at all! I have to use quite a bit (long thick hair) so the bottle doesn't last me nearly as long as any shampoo...but that is always the case, isn't it? Anyway, I highly recommend the whole Soapbox line. Each bottle is only $6 and they can be found at Target. Yes to Cucumbers Shampoo and Conditioner - These were gifted to me for Christmas, and even though I don't need color protection hair products (all-natural red head here ;) I still really liked this line! The smell is wonderful...very mild and fresh. My only gripe would be that I wish the conditioner was a bit thicker, as I felt like it didn't quite work as well as others, such as the Soapbox. definitely going to try that yes to grapefruit scrub, it sounds awesome. I need to try that shaving cream, I currently use conditioner on my legs to shave because I haven't found one I think is worth spending the money on! 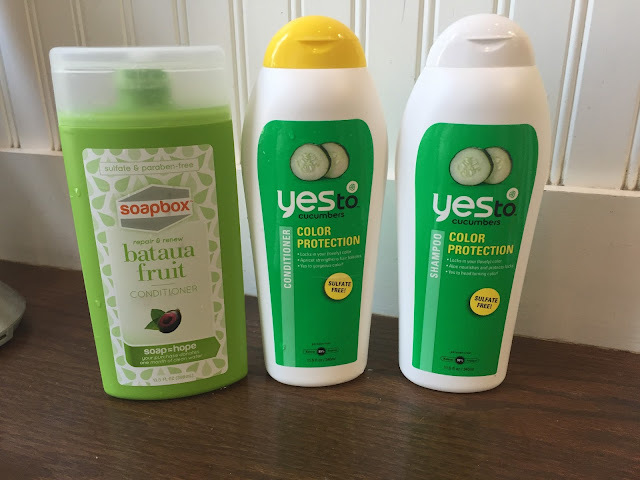 I really need to try these YES products!